Amy Lee has volunteered the Before pictures of her sewing room as part of the Great Space Clean-Up of 2009. Impressive! July 25, 2009. 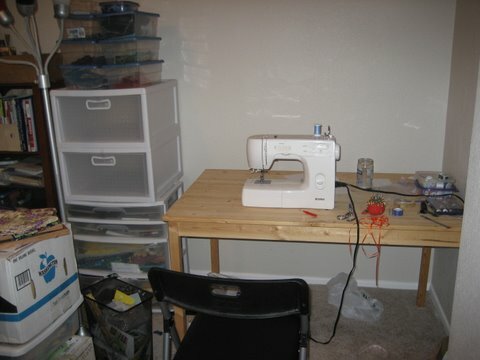 Tags: Before picture, Great Space Clean-Up of 2009, sewing room. Links, Words. 1 comment. I have decided to share the Before pictures I just took of my sewing room, with the theory being that I will post After pictures within a couple months. It’s gotten so bad that while working on the zigzag baby quilt, I’m really only using my sewing room when I’m sitting at the sewing machine itself. Everything else — cutting, pressing, arranging, pinning, etc. — I’ve been doing in the spare room next door. I have acknowledged the depths of the problem, I have motivation from within to change. The process begins today. 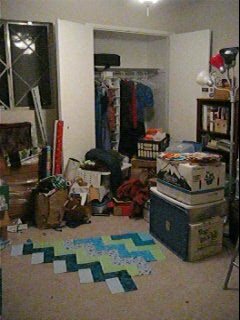 If anybody would like to share Before pictures of their own sewing room or other space clearly in need of some attention, I’ll link to you. 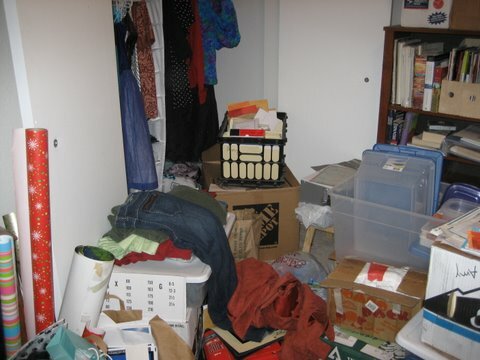 Maybe it’s as small as a junk drawer or as large as a three-car garage, I know you have your own disaster area. Let’s organize them before the end of the year. We can call it the Great Space Clean-up of 2009. Who’s in? The first picture shows part of my current zigzag baby quilt. There are over half a dozen unpacked boxes sitting around. We moved into the house 11 months ago. The dresser is still wrapped in the plastic the movers used to hold in all the drawers. Again, we moved into the house 11 months ago. 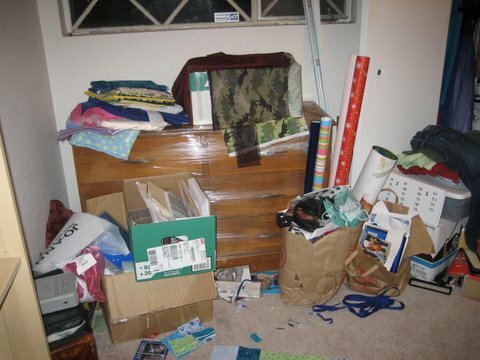 Does the crumpled paper bag of gift wrapping supplies really need to be in my sewing room? And could the supplies maybe be kept together by something other than a crumpled paper grocery bag? The closet doors are open because there’s too much stuff in the way to close them. The bottom two pictures show quite a few clear plastic bins and drawers. In theory, these can be used to hold things other than slightly smaller clear plastic bins. The window had blinds at one point. They fell on me one day around Christmas when I pulled on the string to open them. They have been leaning against the window ever since. I regularly vacuum the patch of open floor space, especially before laying any fabric on it. The patch keeps getting smaller. I pretend not to notice. July 22, 2009. 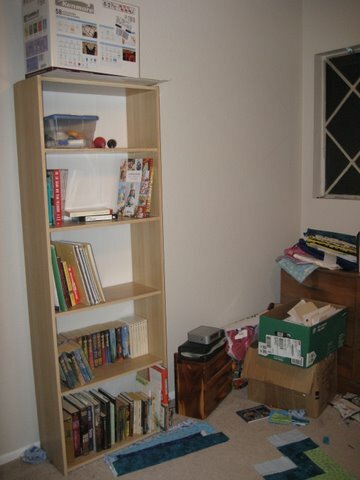 Tags: Before picture, cleaning, Great Space Clean-Up of 2009, organize, sewing room. Pictures, Projects, Words. 5 comments.